The holidays roll around and that typically means that all kinds of cookie exchanges come along with it. I've never really been interested in participating in any kind of exchange primarily because I really only like cookies when they're fresh. Cookies just lose all their appeal to me once they cool down. I didn't take one picture of all the food I made for Thanksgiving. I made a few new recipes and had a great time with the families that we invited over to our home but was just too caught up to take any pictures. I'll remake a few of my favorites and post them in the next week or so. For tonight though I thought I'd post my favorite new thing to do the day after Thanksgiving, and it's not shopping. It's making Turkey Stock! I love homemade stock but don't usually take the time during the rest of the year but I really should. Homemade stock whether chicken or turkey makes a huge difference in any recipe that you're making. It's so rich and flavorful and anything you make with it will be 10 times better than if you used canned or bouillon stock. Many of you are probably already familiar with our family tradition of Pancake Wednesday's. This tradition has been going on for over 10 years now and I've been using the same recipe now for that whole time. I have to admit, and I think I could get a few backers, that my pancakes are pretty amazing. For that reason, I rarely try any other recipe. There's just something about fall when it seems like everything should have some kind of pumpkin and spice in it. Of course there's your pumpkin pie and I also have been using pumpkin in a chocolate ship cookie recipe that I'll post later, however, it's also fun to find some new ways to add this great ingredient into new recipes. Pumpkin adds a great light flavor to breads and cakes and probably isn't as strong as you would think. It helps make a really moist dough and also gives the dough a nice light orange color. 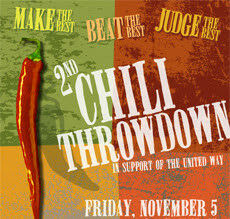 On Friday, November 5th 2010, Yale University Dining hosted it's second annual "Chili Throwdown." 22 different chili's were entered into the competition, one of which was a recipe created by my Dad, an Associate Chaplain at Yale. He came out in third place, beating out all of the Yale Chefs and other organizations except for the Chef of Berkeley college, who won first prize and the Chef for Saybrook and Branford colleges who took second. I've been on the search for a great soup recipe for our church chili/soup cook-off this week and I think I may have found one that qualifies! I don't know if I could ever pick just one soup to be the best since I love so many different kinds of soups but it is fun to try out new things and I'm excited to see what everyone else brings to the dinner as well. There is nothing like a good bowl of warm soup in the fall and winter. Whenever I eat at a Chinese restaurant I usually end up getting Sweet and Sour Chicken, at least at the buffet's or restaurants of questionable quality. It's usually safe (at least I think so) and most people can get it so it at least tastes pretty good. I've experimented with making sweet and sour chicken before and I've come up with some pretty good variations but never anything that was just amazing, especially with the sauce.